Most existing Myanmar fonts use the Windows 1252 Code Page encoding, but substitute Myanmar glyphs* in place of the English (Latin) glyphs. Unfortunately there is no standard for which Myanmar glyphs go with a particular Latin character, so many fonts are incompatible with each other. Some Myanmar consonants, semi-vowels and vowels can have different shapes according to context and so each of these is represented as a different character in the font. This means that a normal computer keyboard is unable to type several of these characters with the normal key and key + Shift combinations. Instead the user must type the character code by hand or use Ctrl and Alt keys*. The former is difficult to remember and the latter is problematic because it prevents keyboard shortcuts being used for menus etc. The Unicode Code Points for Myanmar are defined in Unicode 5.1 in the code space from U+1000 to U+109F. Unicode always uses the same code point for the same character or semi-vowel, even if it changes shape depending on the context. Invisible codes such as virama are used to specify the characters in their different forms. This means that complex rendering software is needed to choose the right glyph. There is no longer a 1-to-1 relationship between code point and glyph. Another consequence of using Unicode is that the order you type and the order you store Myanmar characters in your file are different. This means you need a smart keyboard technology (an Input Method) to convert what you type into the correct sequence of Unicode characters. 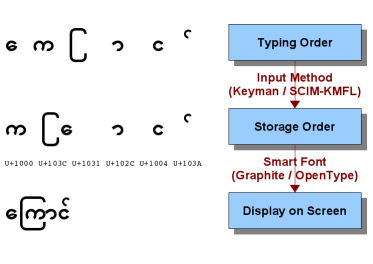 The difference between the typing order, the storage order and the order that glyphs are displayed on screen is summarized in the figure below for the Myanmar word for a cat.